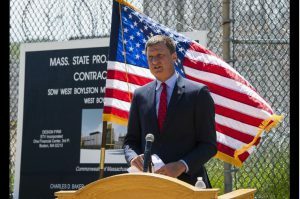 WEST BOYLSTON – Worcester County is going to be a “better, safer place,” officials said Thursday, thanks to a $20 million, state-of-the-art receiving, medical and regional lock-up facility on the campus of the Worcester County Jail and House of Correction. 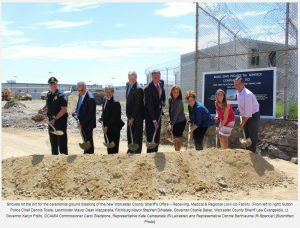 During a groundbreaking ceremony Thursday, Worcester County Sheriff Lewis G. Evangelidis said this day is for all the workers at the jail, including Worcester County Sheriff’s Office Superintendent David Tuttle, who also spoke. 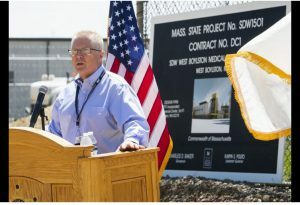 The 32,000-square-foot, two-story receiving, medical and regional lock-up facility is the first major construction project of a permanent building on the jail campus since the original West Boylston facility was built in 1973. Modular units, which still stand today, were erected in 1990. The new building is expected to be completed by fall 2019. 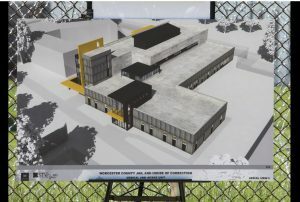 Funded through the state Division of Capital Asset Management and Maintenance, the construction project will provide a centralized intake and release area, medical and mental health housing unit and expanded regional lock-up unit capacity, providing local police departments the ability to transport individuals who are placed into police custody directly to the Worcester County Jail, especially during weekends, holidays and off-times. “For our point of view, this is a team effort,” Mr. Baker said. “We are very pleased to be able to partner with the sheriff’s office and with all of you, to put this in the ground, to build this facility, and to make it sing here in the county of Worcester. Lt. Gov. Karyn E. Polito also praised the commitment of jail workers to help change inmates’ lives for the better and she stressed the need for the lock-up facility. Carol Gladstone, commissioner of the Division of Capital Asset Management and Maintenance, stressed the medical importance of the new facility. She said the jail takes in 6,000 people a year, 90 percent of them “somehow” involved with drugs or alcohol, and 50 percent who are detoxing. “This medical facility, really, is the first step in getting people, hopefully, moving them past the crisis of their lives that they are experiencing,” Ms. Gladstone said. Sutton Police Chief Dennis Towle, speaking on behalf of the Worcester County Chiefs Association, said the two biggest obstacles local police departments face is personnel workload and budget. The Worcester County Jail and House of Correction is responsible for both pretrial detainees and inmates sentenced to 2½ years or less. The correctional facility currently houses more than 1,000 inmates and has a staff of over 600. Leominster Mayor Dean J. Mazzarella and Fitchburg Mayor Stephen L. DiNatale also participated in the groundbreaking.